First of all, thanks to STASH MAGAZINE for the great review in the February issue. If you’d like to read this review, you can surf on in to STASH MAGAZINE ONLINE via our LINKS page. Liz & I had a great time aboard the TAMPA BAY BLUES CRUISE in January on the Regal Empress cruiseliner. Joining us on the cruise were our good friends Roy Book Binder & Rock Bottom, and other musicians included Hal Hammer, Debbie Boyer & The Austin Pettit Band, and other fine players as well as fans & friends. The four-day cruise made a one-day stop in Cozumel, Mexico- a good place for shopping, sightseeing, & a stop at the Hard Rock Cafe. The food on the Regal Empress was out-of-sight! SAFFIRE: THE UPPITY BLUES WOMEN have been performing one of Liz’s songs “Take It Slow”, and it’s in the running for inclusion on their next CD release on Alligator Records in June. We heard SAFFIRE do “Take It Slow” recently at a festival in Tampa- quite an honor! SAFFIRE is a great, sassy all-female blues band- catch them at a live show if you get the chance. You can check out their website on our LINKS page. We’ve been busy booking our 2001 Summer Tour for July & August. The tour schedule includes many of our old haunts in Ohio, Indiana, West Virginia, Tennessee and other states, but there will be some new venues as well. Although we’re still putting this schedule together, you can check out our DATES page for cities booked so far. 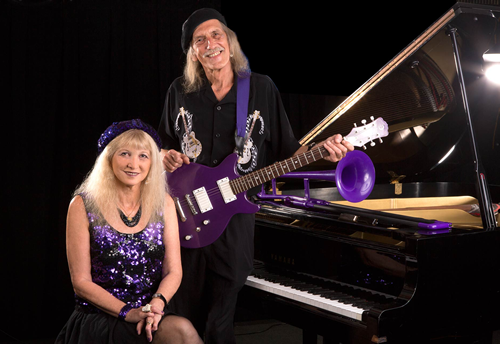 Starting this week, Liz & I will be playing every Wednesday at TYCOON’S JAZZ LOUNGE in downtown St. Petersburg. TYCOON’S is a classy, upscale speakeasy with a beautiful grand piano. Come on by around 8 pm and “dress to impress”- this is your chance to see me in a suit! Please refer to our DATES page for details. That’s all for now- thanks so much for supporting live music in your area!